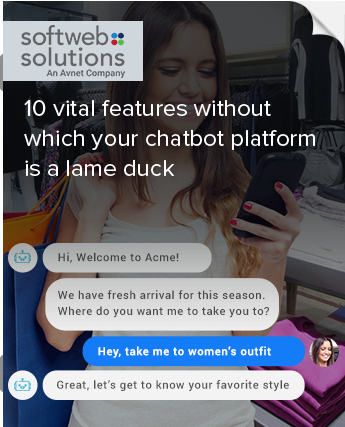 how chatbot integration with salesforce helps business to generate better RoI? 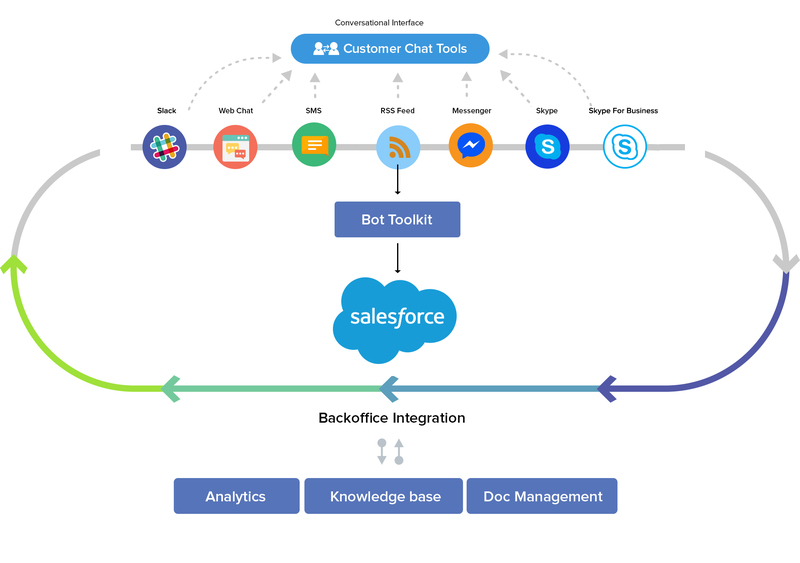 Share the post "Chatbot integration with Salesforce is delivering faster results to companies"
We are living in a digital age where customer relationship management (CRM) is essential for every enterprise that wants to successfully evolve using technology. Today, enterprises want to leverage round-the-clock interactions with their customers with a single touch point. The value of CRM data is gradually increasing, especially now as chatbots are being integrated with enterprise software. Salesforce is one of the best-in-class platform service that allows enterprises to leverage artificial intelligence (AI) and automate their CRM. With Salesforce chatbot integration, you will have a chatbot residing in your system, allowing you to take charge of multiple functions. Siri, Alexa, Facebook, and Slack chatbots have already made this way of accessing information popular. Rather than searching for information on the website or navigating through the applications, a chatbot can simply bring you the relevant information straight to your chat box. Smart chatbot for BFSI industry – What can it do for you? Chatbot with Salesforce: How does it work? Salesforce platform is API first, so it’s easy to integrate a chatbot with Salesforce. Salesforce is a large application in itself and integrating a chatbot will allow the user to quickly access information, without leaving the task being perfomed. Bot Commands are custom objects that are used to store chatbot commands. A Bot Command is functioned to create a mapping between expressions (to understand the pattern for the user’s question) and an Apex Class is featured to provide the logic to the generated response. For instance, you may ask a question such as ‘find contact Alan’, ‘search contant Alan’, or simply ‘contact Alan’. All these are the regular expressions that the Bot Toolkit will pass to HandlerFindContact, where ‘Alan’ will be identified as a parameter. A series of standard bot commands are available in the Bot Toolkit and Apex handler classes. You can also add your own bot commands and provide mappings between regular expressions and your own Apex handlers. The Bot Toolkit is facilitated with series of Apex Classes, in which, the Bot Controller is co-ordinating the conversation using submit method to submit a response. The submit method is the area where the Bot Controller will try to match what the user has typed, a regular expression defined by Bot Commands. If a match is found, the Bot Controller will use the handle method in a corresponding handler class. Finally, the Handler Class will utilize a series of utility classes to select the appropriate format for a response and send it to the user, such as Bot Response, Bot Message, Bot Message Button, Bot Item, Bot Record, and BotField. 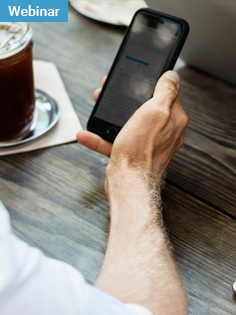 Chatbots are no longer restricted to just consumer facing operations but are increasingly being deployed for increasing employee productivity inside the enterprise as well. In case of straight question/answer interactions received during the conversation, the Bot Toolkit will support such stateful conversations using a session object that represents the state of the conversation and that is passed back and forth between the server and the client. A Bot Response consists of Bot Message objects or optional objects. A Bot Message can be in the form of a plain text message, list of items, records, postback buttons, or image. The Bot component formats the messages in different ways and responds with the best suitable content of each message. 1. Enable Lightning Experience, set up My Domain, and deploy to all users. 2. Install the Bot Toolkit unmanaged package and select ‘Install for All Users’. 3. Make a copy of the bots_commands.csv file on your file system. 5. In Lightning, open the Bot Toolkit application, click the Bot Commands tab and study the list of standard commands. 6. Click Bot in the Utility Bar, and type your preferred commands. Ta-da, your chatbot is ready! 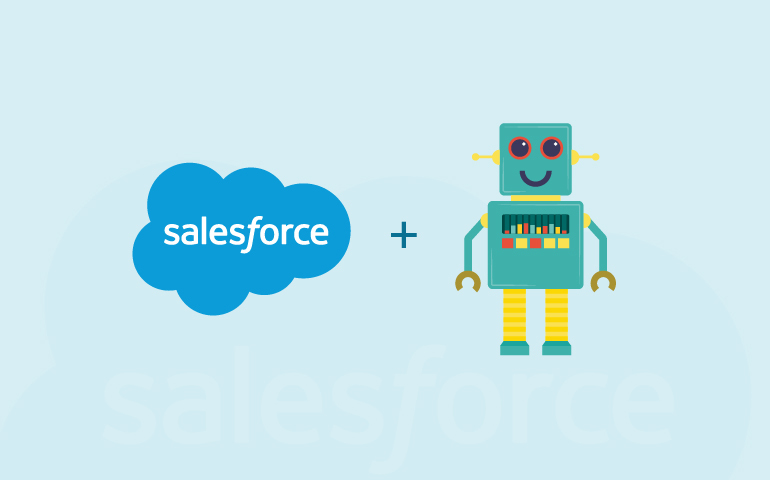 You have successfully created a chatbot in Salesforce, and now your chatbot will allow you to quickly access information using natural language and without switching context. Chatbots are drawing new boundaries for the way users engage with applications. Natural language is the new UI that is facilitating a chatbot to access information. Enterprises should leverage this integration and maximize their productivity. To know more about chatbot integration with Salesforce, you can talk to our Salesforce experts.